The Wits boat club is celebrating the international recognition of its captain. A discussion on reporting under oppressive regimes affirms the importance of investigative journalism in holding power to account. Wits offers new post graduate courses in e-Science. History will continue to be made by the Wits Journalism department, as it honours various influential journalists and media outlets. Wits Student Programme in Law and Society seminar by chairperson of Oxfam South Africa, Mazibuko Jara called for better and sustainable land reform. Five Wits students among the country’s top 100 most employable university students under40 for the GradStar programme. THE WITS University South African Medical Student Association (SAMSA) tried to raise awareness this week among students about their sexual and reproductive health and what they can do to maintain a healthy sexual lifestyle. 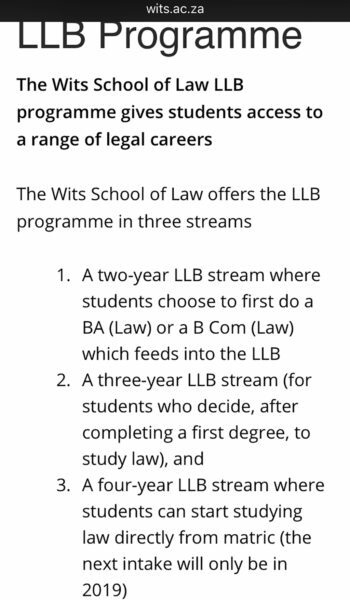 THE WITS SCHOOL of Law remains uncertain on whether it will offer the four-year undergraduate Bachelor of Law (LLB) degree in 2019, but the school is already advertising the study stream on its study page on the university’s website. In 2014, Wits discontinued the straight four-year LLB programme and returned to the traditional two or three-year programme, where students choose to either complete an undergraduate BA (Law) or a BCom (Law) or after completing any other first degree, could embark on an LLB. Earlier this year, the Council of Higher Education (CHE) released a national review of how to standardise and strengthen the quality of legal education and the LLB degree. Until the final report is released, the CHE is recommending all universities also to offer the straight four-year LLB programme. the best. We are going to engage the CHE. We wouldn’t have made the decision to remove the straight LLB on a whim. The four-year LLB training provides a narrow set of skills for the kind of lawyers we need in South Africa. “All firms employing law students say that they’d rather employ students with a broad set of skills and [who have] done the longer programmes. It’s better in the long-term for one’s career as a lawyer and professional training,” said Valodia. “[However], we see the need for the BA and BCom Law and want them to remain. Someone who has studied a BA or BCom Law is not the same as someone who studied a straight LLB because their thinking isn’t confined within the law doctrines only,” said Mfeka. Second-year BA Law student, Reshoketswe Masitenyane, said that she initially wanted to study the four-year LLB stream. However, the BA Law route has broadened her legal training. “The BA degree complements law pretty well. In addition to the law courses [I do] international relations and politics. You have to do a lot of research and write really long essays, essentially [I’m] walking away with a better grasp of the world and improved writing skills. Now I see the importance of the [BA] undergrad. Choosing the BA was a better alternative for me,” said Masitenyane.